While most grebes are reluctant to fly, there are two species that are completely flightless: the Junin grebe and the Titicaca grebe. Both species are endangered and native to South America. Instead of flying away to escape predators, grebes will dive. Diving is about all the do well actually. They are quite awkward walking on land since their feet are positioned so far back on their body, but some, including the Titicaca grebe, can run across long distances using their small wings as a balance. Another weird thing about grebes is that when they groom themselves, they have a tendency to eat their feathers for reasons unknown. Their feathers are waterproof, and the birds can adjust their buoyancy in the water by either flattening the feathers to their body or puffing them up. Their main threats as adults are getting caught up in fishing nets. Eggs and chicks are often eaten by predators, but adults are quite good evaders in the water. 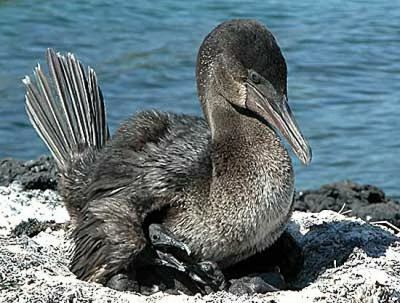 In the Galapagos archipelago, you will find the only flightless cormorant in the world. With This bird sports piercing turquoise blue eyes and is different from other cormorants due to its wing size. The wings are short and stubby, and they couldn’t fly even if they tried. Even though they have the smallest wings, they are the largest of all the cormorant species. Like other cormorants, their feet are webbed, and the birds are superior divers feeding on the ocean floor just off the coast. 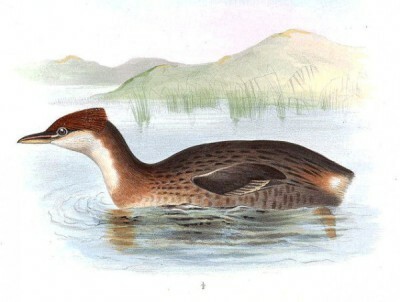 This bird evolved (or devolved) to flightless due to the lack of natural predators in its range. However, like many “predator free” islands, with the introduction of man, comes the introduction of predators which threatens the status of the bird on the Galapagos. The largest bird on the continent, the greater rhea is South America’s answer to the emu and ostrich. The name “Rhea” was derived from the Greek word meaning “winged”. You can see this bird’s gigantic wings if you happen to scare it by mistake. It will run in an eccentric zig-zag pattern while alternatingly lifting each wing. Or, if you are lucky, it will simply sprint at ludicrous speeds. It shares much of its range with its smaller sister species, Darwin’s (or lesser) rhea. Feathered flocks or individuals love to roam flat, open spaces such as agricultural land. They have been known to hide in tall growing crops. Even with their naivety when it comes to predation, the greater rhea are not threatened and have even exemplified an ability to adapt to different environments. They have recently, to the surprise of some, established a feral population in Germany. 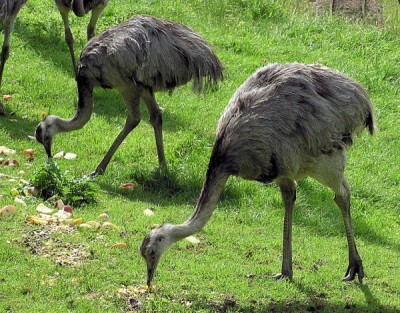 The rheas are perhaps best known for their breeding ritual. A male rhea will seduce many females and build a large nest in which his harem deposits their eggs. The male then does all the incubation of the egg himself. Sure, there are some ostriches being farmed for burgers that have successfully established themselves in Australia’s wild. 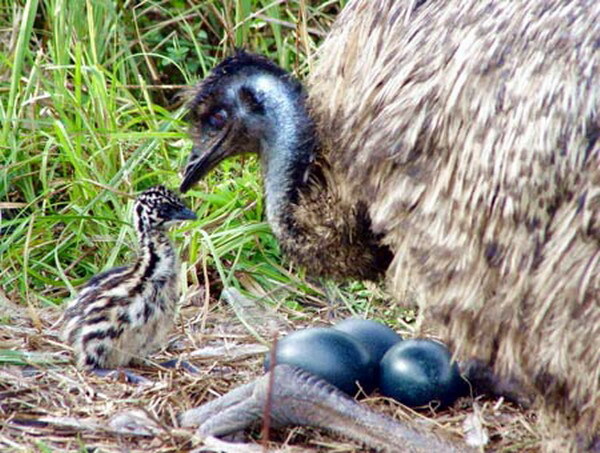 Nonetheless, the emu is the largest bird to call Australia its native home. Only the Ostrich itself stands taller than these nomadic wanderers who have an exceptional capability of starving for weeks on end in search of food. Like many birds of smaller stature, emus swallow rocks to help digest their grub. Like other larger ratites, the emu prefers open space for its endeavors. Since Australia provides an abundance of such sprawling land, the emu is not considered threatened at this point. Of their curious behaviors, none so much captures the imagination as their neurotic dance between sleep and security. At night, they sit down for short naps only to rise and look around a short time later. When attacked by dingo or any other assailants on the ground, they can kick their assailants in the face or rip their cuts out like Zorro carving a “Z”. Younger emus are vulnerable to attack from the air and so run in erratic patterns to avoid creatures such as eagles. A long bluish black neck and head with a red, draping gobbler gives the southern cassowary a peculiar look. This bird is one of three species of cassowary that roam the tropics of Papua New Guinea. 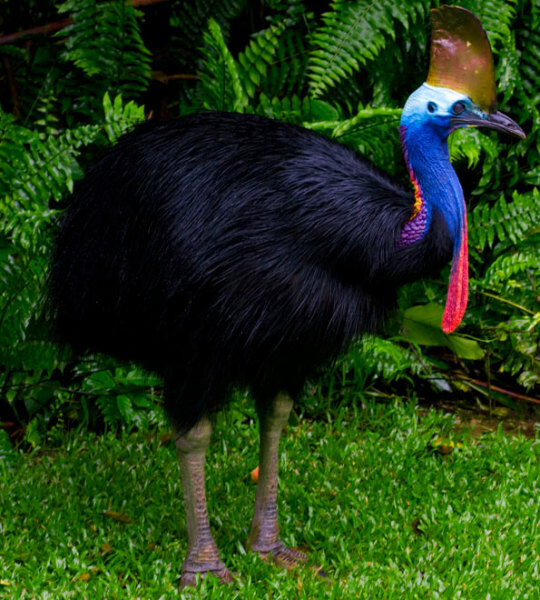 The cassowary’s choice of habitat is unique among other larger ratites such as the emu and ostrich because it prefers forests over plains. Sustained mostly by fruit, vegetation, and the occasional insect, this shy creature keeps to itself. Though they will try to avoid human contact, cassowaries will attack humans, dogs, or anything they feel threatened by. Cassowaries can tear holes in your body like Swiss cheese, and there are have been an upwards of around 200 attacks reported per year. Many of these humans aren’t getting the hint: don’t feed wildlife! Most violent incidents are a result of coaxing these animals with food. They should be left to their own devices if encountered in the wild. Meanwhile, they are gorgeous creatures and should be ogled at a safe distance (or at a zoo). Penguins are on this list, not because of their size or conservation status. They are here simply because they are just plain cool. These flightless critters have an amazing story to tell. They swim in the ocean and migrate hundreds of miles on land throughout the year between nesting and foraging areas. They are faithful to their one mate each year and after laying an egg, the mother transfers it to the father who balances on their feet. 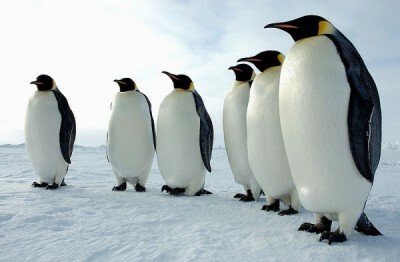 I mean, come on, check out the emperor penguin’s fancy tux. Who doesn’t love these guys?